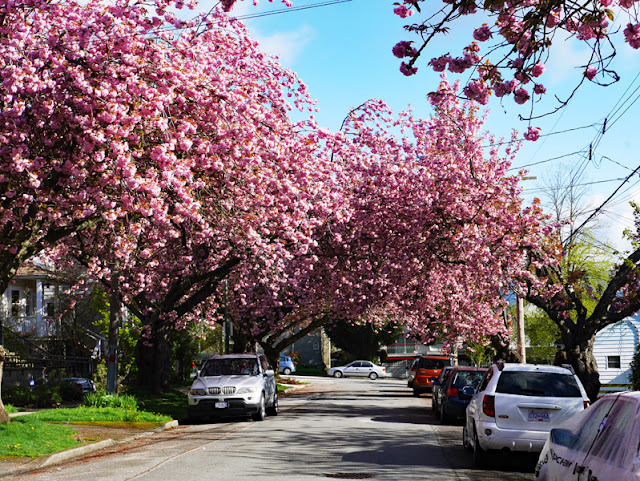 Cherry trees arch across the street where our youngest daughter and her husband live in Vancouver. The trees are some of those donated in 1958 by the Japanese Consul, Muneo Tanabe, as "an eternal memory of good friendship between our two nations." The trees are aging. Ashley told us of a neighbour who, as she parked her car on the street, heard a crashing sound behind her and saw that a tree limb large enough to span the road, had fallen just behind her car. These days, traffic on these streets is busier as many people come to photograph the trees. They bloom all over the city, but the ones in this area are a bit later and attract those who just can't get enough of the Prunus genus. I know I was out there with my camera snapping away. The City regulations allow for backyard chickens. We got to meet Gala, Fuji (rather feisty), McIntosh, and Granny Smith. They live in a large and airy coop in the back garden. I helped Ashley do some weeding on Saturday morning and we were sure to save the good weed greens, such as dandelions and chickweed) as a treat for the hens. The hens lay around 5 eggs per week each. Each hen's eggs are a slightly different colour. We enjoyed a delicious breakfast of fresh eggs, bacon, pastries from a local bakery, and sliced tomatoes. A weekend goes by so very fast. While Ashley and I weeded, Owen and Tim went to the lumber yard for supplies to repair the deck. We walked, just a few blocks, to Le Marché St. George for a lunch of crepes and/or quiche, and the spiciest chai tea I've ever tasted. It was too spicy for me, so Tim got to drink two bowls. The tiny restaurant was jam-packed, so, in spite of the chilly rain, we ate outdoors, on the sidewalk, à la française. Cozy blankets and pillows provided by the restaurant kept us warm. We crossed on the ferry Sunday afternoon, in time for dinner with the families who live on this side of the water. Beautiful tour of Vancouver. Those flowers are lovely. What a beautiful neighborhood with the trees in full bloom. Love seeing those chickens and fresh eggs, too. Wish we could have shared those bowls of chili. (although it would have probably been too hot for me too!) Enjoy your week! The trees would seem to require some judicious pruning. They sure are beautiful. Those eggs are also beautiful. I am so happy that eggs have returned to a more reasonable price. Maybe it was because so many invested in chickens like your daughter. 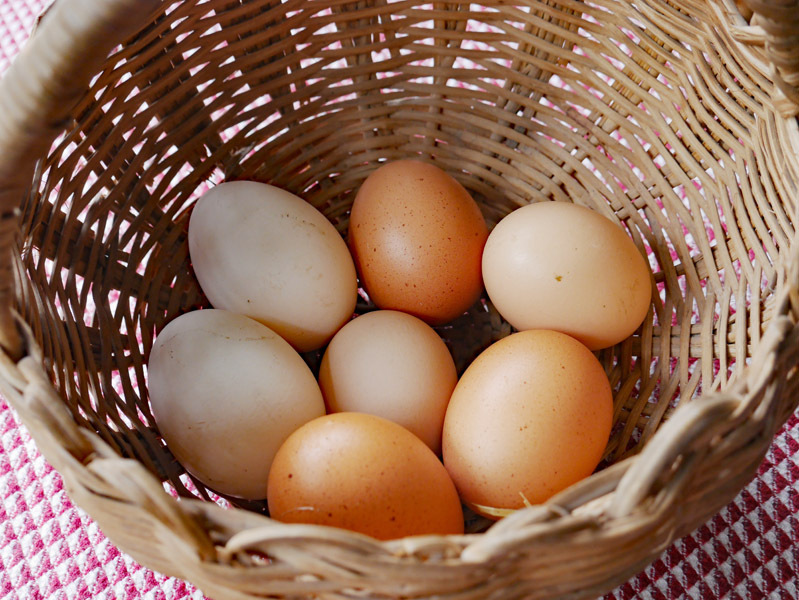 Nothing is more delicious than fresh eggs. Oh my, those are some beautiful trees!! So lovely to think of their symbolism while enjoying their beauty. 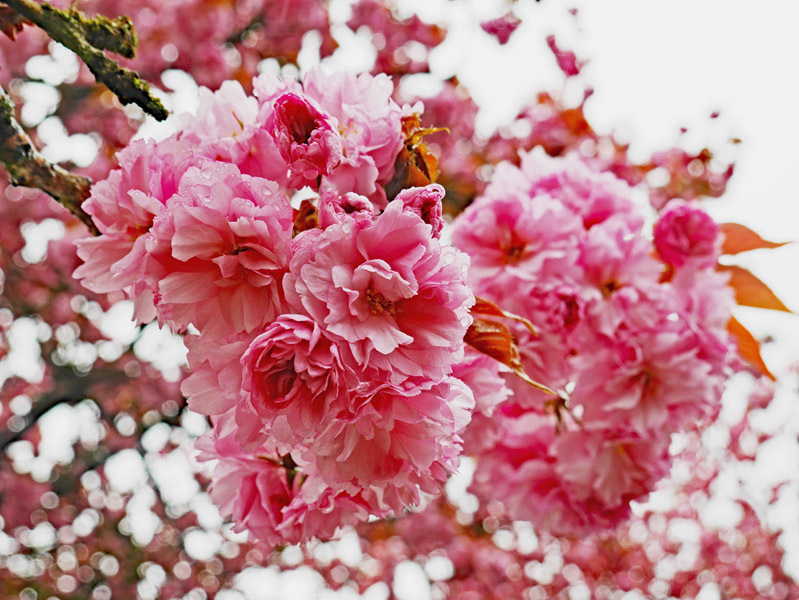 Cherry trees are such a pretty sight. It would be fun to have some pretty chicken in the garden:) Have a nice week! Such beautiful cherry trees in bloom! My son and daughter in law had chickens in their former house and we all enjoyed the very fresh rich eggs, Sadly their new neighborhood does not allow chickens. Have a wonderful week Lorries! Sounds like it was a wonderful time, Lorrie. The cherry trees are gorgeous and I bet they do bring a lot of tree peepers! I hope we get to visit Vancouver again soon. We were there a little over a year ago, my second visit. An absolutely lovely place! Sounds idyllic. Love the blossom and the sweet connection. One of my favorite places to visit is Vancouver - thanks for sharing your time there, looks awesome Lorrie dear. What a lovely weekend! Yummy food, stunning spring scenes, and time spent with your loves . . . all delights for the heart. Sounds like a delightful weekend. It's easy to see why the cameras would be showing up in abundance for the blooming of the cherry trees. What a beautiful sight! Having never been to Washington DC nor Vancouver for that matter, I have never seen a cherry blossom tree in person. Your beautiful close-up photo, Lorrie, makes me want to put them on my bucket list!! Like you I love the ornamental cherry trees when they are in full bloom, sadly all this last week the blossom has been slowly drifting down carpeting the garden in pink snow, so beautiful. Your weekend with family sounded wonderful dear Lorrie, how blessed you are. Thank you for sharing this glimpse into your delightful vie quotidienne. The trees are just gorgeous. As I was reading I wondered what the lifespan was. Hello Lorrie, I don't know which I admire more, the gorgeous subjects of your photos or the wonderful photos themselves. The Prunus have the biggest blooms I have ever seen and the chickens and their eggs are so pretty! I'm sure you're treasuring this wonderful time you spent there ! Gorgeous as always your photographs, thank you for sharing it all with us ! There are many who claim that water baptism is not essential for salvation. Are they doing the work of Satan? Denying the role of immersion in water for salvation is nothing new. Did Satan instigate the view that the washing of regeneration was not immersion in water? Did Satan instigate men to claim that Jesus did not sanctify and cleanse the church with water? Are there contemporary Cainite teachings today? Are they trying to destroy the purpose of water baptism? Would it not be following the example of a viper Cainite to suggest that being born of water, was not water baptism? Being born of water and the Spirit is required. Are the modern versions of the viper Cainite trying to destroy water baptism by denying that Jesus said "Is baptized will be saved"? The subtle way to destroy water baptism is to deny that it is essential for the forgiveness of sins. Contemporary viper Cainites at work. Men were denying the Biblical purpose of immersion in water 1800 years ago. Nothing has changed. The Biblical facts are indisputable. Immersion in water is essential for salvation and no amount of Cainite logic can alter that fact. What a beautiful area! Those trees are so delightful! 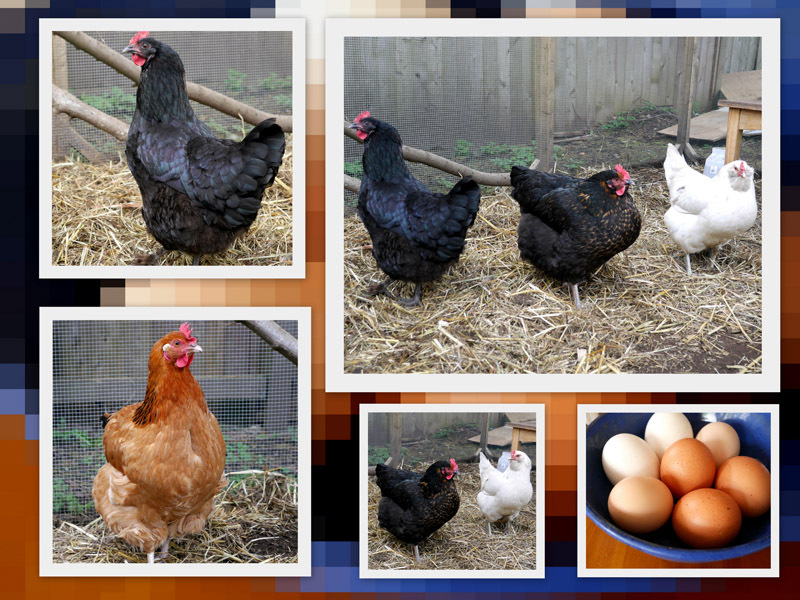 We have chickens too, and love the fresh eggs! I love your daughter's chickens' names after apples! What beauty in Vancouver, Lorrie! My youngest son and DIL have chickens, too, and they get the prettiest eggs. I would've loved that chai tea! Such glorious blossom....your pictures are delicious! Love the hens and perfect eggs too. So glad you had a happy family time Lorrie. Enjoy your week. The cherry blossoms are beautiful! Sounds like you had a productive visit! Gorgeous trees! Those eggs look real good, too. Glad you had a good visit. What a beautiful post, your photographs are lovely. So good to spend time with the family too! How beautiful cherry blossoms are! I'd like to go hanami. What a privilege to have those beautiful trees on the street. I hope they can be saved to live on and on. The whole neighborhood sounds lovely. And I'm thankful more and more neighborhoods are allowing hens now. The ladies are pretty. We still miss ours but at least our son and future d-i-l share their hens' eggs with us. Your weekend sounds lovely, Lorrie! Your kids live in a wonderful city! Chickens are allowed in Eugene city backyards too....I love that! The cherry blossoms are beautiful ..I hope they can somehow save the trees. Beautiful cherry trees! Sounds like a fun weekend as well as a help to your kids. Nice the restaurant supplied the blankets and pillows! The cherry blossoms arching over the street are just gorgeous. I had to smile at the names for the chickens, cute! The blossom is stunning. Glad the tree missed the car, especially as someone might have been in it. Surprised that one had to have permission to have chickens in their garden. The blossoms of the city are just beautiful...and you captured them so well. Sounds like a fun visit to your kids in the big city (with backyard chickens)! Sounds like such a fun little visit!